Purchase File Cabinets: Choose From Our Wide Selection! Keep important records secure and in order with file cabinets from Hertz Furniture. Whether you choose functional steel or classic wood, we have what you need to organize the office. With the right filing cabinets, you can ensure that there is a proper place for all papers. What are the different kinds of file cabinets? Hertz Furniture&apos;s selection includes a diverse range of sizes and styles - including lateral filing cabinets and blueprint storage. Mobile units offer extra convenience, and fireproof models provide the ultimate protection. What are the most important things to consider when choosing file cabinets? When choosing a filing cabinet, the preliminary considerations should be for office space and the kinds of documents that need to be stored. Papers come in different sizes, and you don&apos;t want to be forced to fold documents or use up extra space for no reason if you get a unit that has inappropriately-sized drawers. File cabinets come equipped to hold letter- or legal-sized files, so before ordering you should figure out which size your workplace uses. Once the paper size has been determined, the next consideration should be office space arrangement. If you are planning on putting file cabinets in a separate storage room, you might be able to be more flexible about space as clutter is less of a problem in an area that clients don&apos;t see. If there is a certain area of a personal office or shared workspace that is allotted for filing, it is necessary to determine which configuration will be the best fit. What is the difference between lateral and vertical file cabinets? File drawers come in either lateral or vertical arrangements. Vertical files have a smaller footprint and a lower capacity per drawer. Lateral files have large drawers that can fit many papers but they take up more floor space. With the vertical arrangement, units can sometimes get quite tall. The lateral configuration generally leaves some open wall space above the unit so there is room to hang a picture a diploma, or even a wall-mounted cabinet above it. What style file cabinets should I get? The typical, most budget-friendly choice is a steel file cabinet. 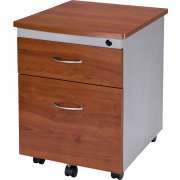 Steel filing cabinets are sturdy and tough and are available in a huge selection of colors. With multiple hues, a file room can be color-coded to make it easier to locate necessary documents. However, while steel filing cabinets are tough and budget-friendly, they might not fit in so well in a law office or accountancy firm. If you are looking for a style that will blend in with, or even enhance a professional workspace, wood filing cabinets are the best option. Many of our models are part of classic or contemporary office furniture collections so they can be matched perfectly to office desks, hutches and more. Wood is strong and reliable and has an attractive natural appearance. File drawers don&apos;t have to be part of stand-alone units. If you need something that can accommodate documents as well as office supplies or electronics, we have storage units which include filing drawers as well as cabinets. This winning combination enables professionals to keep everything they need stored in one convenient place. Where can I file blueprints and other large papers? When oversized documents such as diplomas, blueprints and drawings need to be stored, special filing equipment is required. In order to fit blueprints into a drawer that is meant for letter or legal files, you will have to fold them. If you prefer to keep documents uncreased, they can be stored in our great blueprint storage racks or carts. For a locked option, consider a flat file with individual drawers in which multiple drawings or documents can be stored securely. There is nothing more frustrating than dropping a file full of confidential documents and watching as papers scatter everywhere. When files have to be moved from one place to another for meetings or planning sessions, it is easy for papers to slip out along the way or become exposed to prying eyes. Mobile file cabinets enable you to avoid these dangers and inconveniences. Rather than having to carry papers from floor to floor, the whole locked unit can simply be rolled to the desired location without compromising anything. What is the most durable file cabinet? Irreplaceable documents and critical information need the optimal protection. It is not enough to keep papers under lock and key. Fireproof file cabinets will protect important documents for up to an hour in direct flames. If you want to ensure that your papers have the best protection possible, they are the ideal choice. A well-organized office is sure to impress clients and potential partners. With the right file cabinets from Hertz Furniture, you can keep all documents secure and readily-accessible for quick retrieval. If you need help selecting the right style or figuring out exactly which model will fit best in the space you have allotted, contact the Hertz Project Solutions team for free project-planning advice.